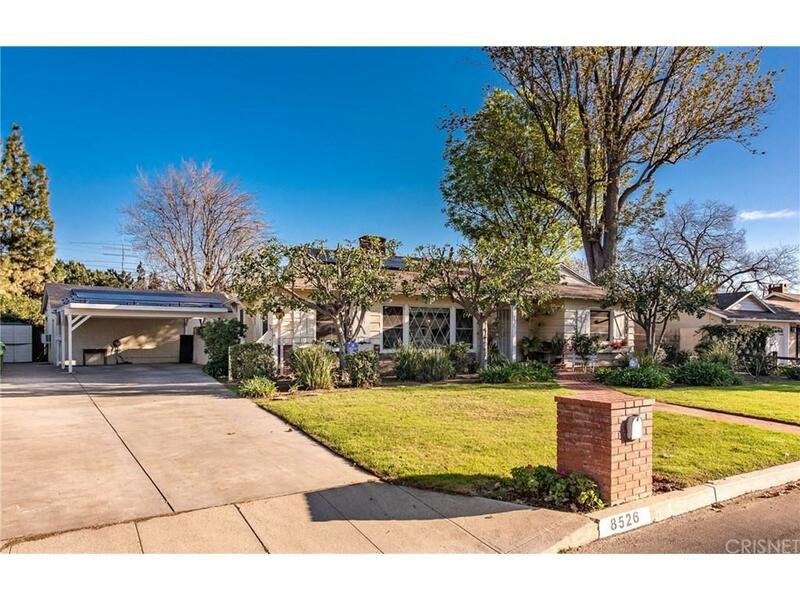 Super Charming Winnetka Ranch Style Single Story Located on a Beautiful Street and on an Expansive and Deep 16,860+ Sq. Ft. Lot! This Light Filled Home offers 3 Bedrooms (Den is 4th Bedroom on title), 3 Baths, Over 1900 Sq. Ft. of Comfortable Living Space with Gleaming Wood Floors, Wood Beamed and Smooth Ceilings, Crown Moldings, Dual Paned Windows (Some Double Hung), a Cozy Brick Fireplace and Wet Bar in the Living Room, and a Remodeled Kitchen (2011) with Center Island, Deco Designer Glass Backsplash and Tons of Cabinet Space. Master Suite with Large Mirrored Wardrobe, French Doors, Recessed Lighting, and Private Bathroom. Secondary Bedrooms and Hall Baths are Ample Sized. Separate Guest Unit/Pool House is Great for Extended Family, Home Office, Gym or?? and Boasts Living Area, Kitchenette, Dining Area, Bedroom, Bathroom and Private Patio Deck. Entertainers Rear Yard with Sparkling Pool, Patio, Basketball Hoop and Large Grassy Area. Additional Amenities Include: Central Air & Heat, Copper Plumbing, Fully Owned and Cost/Energy Saving Newly Installed Solar Panel System, Newer Roof, Updated Electrical Panel and Wired for Electric Car Charging Station, plus 2 Car Carport with Plenty of Room for RV/Boat Parking! This one is a Winner!